दुर्गा Durgā, meaning "the invincible"
"Mother Durga" "one who can redeem in situations of utmost distress" is a form of Devi, the supremely radiant goddess, depicted as having eight arms, riding a lion or a tiger, carrying weapons and a lotus flower, maintaining a meditative smile, and practicing mudras, or symbolic hand gestures. Maa Durga is the Mother Goddess, as well as the slayer of evils at the same time. Durga Maa is a form of Adi Shakti, the supremely radiant Goddess. In Sanskrit Durga means “One who is incomprehensible or difficult to reach”. Goddess Durga represents the supreme power and is worshiped in various forms including Parvati, Bhairavi, Vaishnavi, Kali, Jagatmata, Mahishasurmardhini, Gauri, Chandi and Uma. 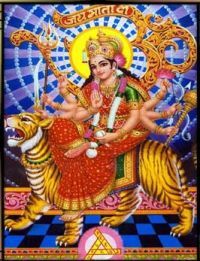 Durga's darker aspect is Kali Maa. An embodiment of creative feminine force (Shakti), Durga exists in a state of svātantrya (independence from the universe and anything/anybody else, i.e., self-sufficiency) and fierce compassion. She is Maha kali, the fiercer, demon-fighting form of Shiva's wife, goddess Parvati. Durga manifests fearlessness and patience, and never loses her sense of humor, even during spiritual battles of epic proportion. “SARVA BADHA PRASHMANAN TRAILOKYA SYAKHILESHWARI, EVAMEVMEV TVAYAA KAARYAM SMA DVERI VINAASHNAM. “DEHI SAUBHAAGYAM AAROGYAM DEHI DEVI PARAM SUKHAM. Durga Maa, preserve thy seed, for the seed has grown! Which pictures the cosmic cycle free of sin..
Durga Maa, erase the seed, may new life begin! OM YAGYEN YAGYA MAYA JANT DEVAASTAANI DHARMAANI PRATHMAA NYAASAN. THE NAAKAM MAHIMAANAH SACHANT YATRA POORVEY SAADHYAH SANTI DEVAAH. This is the most popular mantra of the divine Mother Durga. This mantra should be repeated 500,000 times. The Divine Mother and representation of compassion, strength, morality and protection. She protects her devotees from evil powers and safeguards them. It is believed that Goddess Durga is said to be the combined form of powers of Goddess Laxmi, Goddess Kali and Goddess Saraswati. She is a daughter of Himalaya and first among nine Durgas. In previous birth she was the daughter of Daksha. Her name was Sati - Bhavani. i.e. the wife of Lord Shiva. Once Daksha had organized a big Yagna and did not invite Shiva. But Sati being obstinate, reached there. Thereupon Daksha insulted Shiva. Sati could not tolerate the insult of husband and burnt herself in the fire of Yagna. In other birth she became the daughter of Himalaya in the name of Parvati - Hemvati and got married with Shiva. As per Upnishad she had torn and the egotism of Indra, etc. Devtas. Being ashamed they bowed and prayed that, "In fact, thou are Shakti, we all - Brahma, Vishnu and Shiv are capable by getting Shakti from you." The second Durga Shakti is Brahamcharini. Brahma that is who observes penance(tapa) and good conduct. Here "Brahma" means "Tapa". The idol of this Goddess is very gorgeous. There is rosary in her right hand and Kamandal in left hand. She is full with merriment. One story is famous about her. In previous birth she was Parvati Hemavati the daughter of Himvan. Once when she was busy in games with her friends. Naradaji came to her and predicted seeing her Palm-lines that, "You will get married with a naked-terrible 'Bhole baba' who was with you in the form of Sati, the daughter of Daksh in previous birth. But now you have to perform penance for him." There upon Parvati told her mother Menaka that she would marry none except Shambhu, otherwise she would remain unmarried. Saying this she went to observe penance. That is why her name is famous as tapacharini - Brahmacharini. From that time her name Uma became familiar. The name of third Shakti is Chandraghanta. There is a half-circular moon in her forehead. She is charmful and bright. She is Golden color. She has three eyes and ten hands holding with ten types of swords - etc. weapons and arrows etc. She is seated on Lion and ready for going in war to fight. She is unprecedented image of bravery. The frightful sound of her bell terrifies all the villains, demons and danavas. Name of fourth Durga is Kushmanda. The Shakti creates egg, ie. Universe by mere laughing .She resides in solar systems. She shines brightly in all the ten directions like Sun. She has eight hands. Seven types of weapons are shining in her seven hands. Rosary is in her right hand. She seems brilliant riding on Lion. She likes the offerings of "Kumhde." Therefore her name "Kushmanda" has become famous. Fifth name of Durga is "Skanda Mata". The daughter of Himalaya, after observing penance got married with Shiva. She had a son named "Skanda." Skanda is a leader of the army of Gods. Skanda Mata is a deity of fire. Skanda is seated in her lap. She has three eyes and four hands. She is white and seated on a lotus. Sixth Durga is Katyayani. The son of "Kat" as "Katya". Rishi Katyayan born in this "Katya" lineage. Katyayan had observed penance with a desire to get paramba as his daughter. As a result she took birth as a daughter of Katyayan. Therefore her name is "Katyayani" . She has three eyes and eight hands. These are eight types of weapons missiles in her seven hands. Her vehicle is Lion. Seventh Durga is Kalratri. She is black like night. Durga hairs are unlocked. She has put on necklaces shining like lightening. She has three eyes which are round like universe. Her eyes are bright. Thousands of flames of fire come out while respiring from nose. She rides on Shava (dead body). There is sharp sword in her right hand. Her lower hand is in blessing mood. The burning torch (mashal) is in her left hand and her lower left hand is in fearless style, by which she makes her devotees fearless. Being auspicious she is called "Shubhamkari." The Eighth Durga is "Maha Gauri." She is as white as a conch, moon and Jasmine. She is of eight years old. Her clothes and ornaments are white and clean. She has three eyes. She rides on bull She has four hands. The above left hand is in "Fearless - Mudra" and lower left hand holds "Trishul." The above right hand has tambourine and lower right hand is in blessing style. She is calm and peaceful and exists in peaceful style. It is said that when the body of Gauri became dirty due to dust and earth while observing penance, Shiva makes it clean with the waters of Gangas. Then her body became bright like lightening. There fore, she is known as "Maha Gauri". Ninth Durga us Siddhidatri. There are eight Siddhis , they are- Anima, Mahima, Garima, Laghima, Prapti, Prakamya, Iishitva & Vashitva. Maha Shakti gives all these Siddhies. It is said in "Devipuran" that the Supreme God Shiv got all these Siddhies by worshipping Maha Shakti. With her gratitude the half body of Shiv has became of Goddess and there fore his name "Ardhanarishvar" has became famous. The Goddess drives on Lion. She has four hands and looks pleased. This form of Durga is worshiped by all Gods, Rishis-Munis, Siddhas, Yogis, Sadhakas and devotees for attaining the best religious asset. The 32 Names of Maa Durga. This Durga Stuti (Durgartishmani) of Maa Durga is recited to bring an end to all difficulties in one’s life. नमो नमो दुर्गे सुख करनी. नमो नमो अम्बे दुःख हरनी. निरंकार है ज्योति तुम्हारी. तिहूँ लोक फ़ैली उजियारी. शशी ललाट मुख महा विशाला. नेत्र लाल भृकुटी विकराला. रुप मातु को अधिक सुहावे. दरश करत जन अति सुख पावे. तुम संसार शक्ति लय कीना. पालन हेतु अन्न धन धन दीना. अन्न्पूर्णा हुई जग पाला. तुम ही आदि सुन्दरी बाला. प्रलयकाल सब नाशन हारी. तुम गौरी शिव शंकर प्यारी. शिव योगी तुम्हारे गुण गावे. ब्रह्मा विष्णु तुम्हें नित ध्यावें. रुप सरस्वती का तुम धारा. दे सुबुद्धि ऋषि मुनिन उबारा. धरा रुप नरसिंह को अम्बा. प्रकट भई फ़ाड़ कर खम्बा. रक्षा कर प्रहलाद बचायो. हिरणाकुश को स्वर्ग पठायो. लक्ष्मी रुप धरो जग माहीं. श्री नारायण अंग समाहीं. क्षीरसिन्धु में करत विलासा. दया सिन्धु दीजै मन आसा. हिंगलाज में तुम्ही भवानी, महिमा अमित न जात बखानी. मातंगी धूमावती माता. भूवनेश्वरी बगला सुखदाता. श्री भैरव तारा जग तारणि. छिन्नभाल भव दुःख निवारिणी. केहरि वाहन सोहे भवानी. लांगुर बीर चलत अगवानी. कर में खप्पर खड़्ग विराजै. जाको देख काल डर भाजै. सोहे अस्त्र और त्रिशूला. जाते उठत शत्रु हिय शूला. नगर कोटि में तुम्ही विराजत. तिहूँ लोक में डंका बाजत. शुम्भ निशुम्भ दानव तुम मारे, रक्त बीज शंखन संहारे. महिशासुर नृप अति अभिमानी. जेही अध भार मही अकुलानी. रुप कराल कालिका धारा. सेन सहित तुम तिहि संहारा. परी गाढ़ संतन पर जब जब, भई सहाय मातु तुम तब तब. अमर पुरी अरु बासव लोका. तव महिमा सब कहे अशोका. ज्वाला में है ज्योति तुम्हारी. तुम्हें सदा पूजें नर नारी. प्रेम भक्ति से जो यश गावें. दुःख दरिद्र निकट नही आवे. 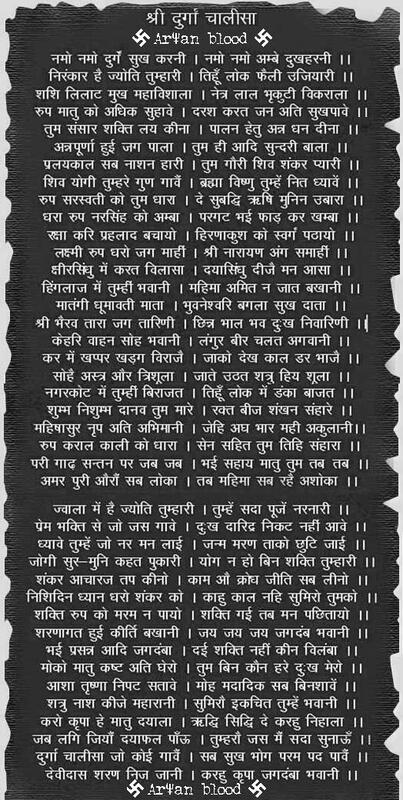 जोगी सुर नर कहत पुकारी. योग न हो बिन शक्ति तुम्हारी. शंकर आचारज तप कीनो. काम अरु क्रोध जीति सब लीनो. निशिदिन ध्यान धरो शंकर को. काहु काल नहिं सुमिरो तुमको. शक्ति रुप को मरम न पायो. शक्ति गई तब मन पछतायो. शरणागत हुई कीर्ति बखानी. जय जय जय जगदम्ब भवानी. भई प्रसन्न आदि जगदम्बा. दई शक्ति नहिं कीन बिलम्बा. मोको मात कश्ट अति घेरो. तुम बिन कौन हरे दुःख मेरो. आशा तृश्णा निपट सतावे. रिपु मूरख मोहि अति डर पावै. शत्रु नाश कीजै महारानी. सुमिरौं एकचित तुम्हें भवानी. करो कृपा हे मातु दयाला. ऋद्धि-सिद्धि दे करहु निहाला. जब लगि जियौ दया फ़ल पाऊं, तुम्हरे यश में सदा सुनाऊं. दुर्गा चालीसा जो कोई गावै. सब सुख भोग परम पद पावै. देवीदास शरण निज जानी. करहु कृपा जगदम्ब भवानी. मधु कैटभ दोऊ मारे सुर भयहीन करे. कहत शिवानंद स्वामी सुख संपत्ति पावे. 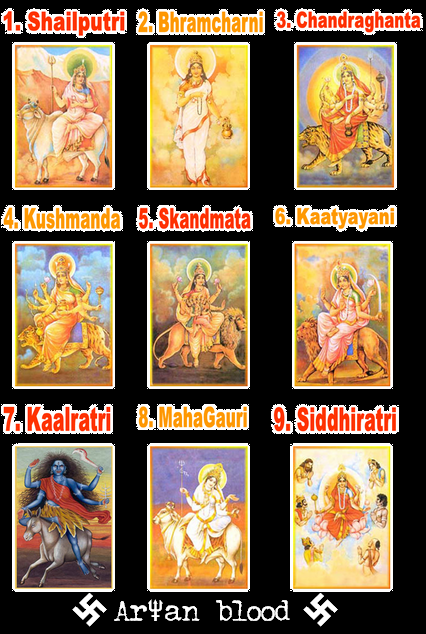 Devi Durga is known by 108 different names. Here are the 108 names of Goddess Durga with English Meaning. These names of Maa Durga is recited to bring an end to all difficulties in one’s life. All these names are well versed in Durga Saptshati by Rishi Markaṇdeya in which Lord Shiva told Devi Parvati one-hundred and eight names, by the means of which Durga or Adi Shakti can be pleased. This is same as given above. This Sapta Shloki Durga Stotra is in Sanskrit and it is told to Bhagwan Shiva by Durga Mata herself. Shiva asked Durga tell me what your devotees should do to achieve success in their endeavor easily and without any troubles? Durga Mata told him that my devotees may worship me by reciting 7 slokas with faith, devotion and concentration. By doing this they will receive all my blessings and will be successful in there every endeavor. Besides they will receive wealth, health, good memory, knowledge, success, good family life and victory. All their troubles, fear, sorrow and poverty will be removed from their life. Many Durga devotees read Durga Sapta shati on many occasions in a year. However all devotees cant read it since it is very difficult and is of 700 stanzas. It takes about 4 to 5 hours to complete it. So for such devotees this Sapta Shloki Durga Stotra is an alternate. 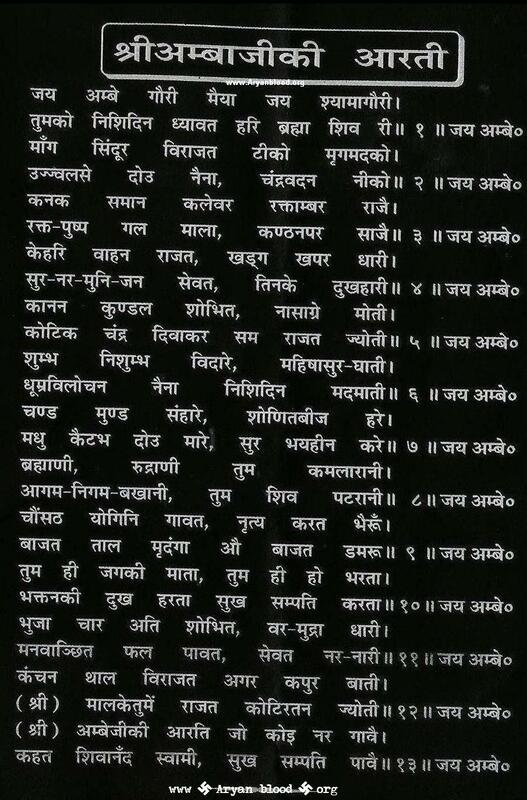 These 7 shlokas of the stotra are from Durga Sapta Shati only. They can recite this stotra daily with faith, devotion and concentration. The Devnagiri Script is available on following link. Devi Stotra "Sarva Mangala Mangalye"
I prostrate myself at Thy feet. O Triyambaks (Three eyed one), Gauri (the one with a fair complexion, Parvathi) Naraayani. This kavacham (for protection) is in Sanskrit, beautifully sang. Must listen to. Taken from Durga saptashati of Markandeya Purana. She is surrounded by eight Skaktis, namely- Ugrachandaa, Prachandaa, Chandograa, Chandanayikaa, Chandaa, Chandabati, Chandarupaa,Ati chandikaa.I pray to Her for the "Chaturbarga" (Dharma, Artha, Kama, Moksha)that is the goal for every human being. Durga Kavach is a collection of special shlokas from the Markandey Purana and is part of the Durga Saptashti. Chanting Durga Kavach during the Navratras is considered auspicious by the devotees of Duga Ma. Mata Shailputri holds a Trishul, a weapon, in her right hand and a lotus in her left hand. She rides on bull. She has pleasant smile and blissful looks. She performed penance to get married with Lord Shambhu (Shiva). She is worshipped on the second day of Navratri. Ma Brahmacharinis idol is very gorgeous. She holds a rosary in her right hand and Kamandal in left hand. The horrible sound of her bell terrifies all demons and danavas. She is worshipped on the third day of Navratri. She is considered as an image for bravery. In her ten hands, she holds Trishul, Gadha, Sword, Chakra, Kamandal, Lotus, Bell, Arrow, Bow etc. weapons. She controls whole Solar system. She likes offerings of Kumhde, hence her name Kushmanda has become popular. Kushmanda Devi is worshipped on the fourth day of Navratri. Devotees worship Skanda Mata on the fifth day of Navratri. Skanda Mata is considered as a deity of fire. She holds Skanda in her lap. Katyayani Devi is worshipped on the sixth day of Navratri. She is considered as prime deity of Vraj mandal. Ma Katyayani has three eyes and four hands. She holds a sharp Sword in her right hand. She blesses her devotees with her lower hand. She holds a burning torch in her left hand. She makes her devotees fearless with her lower left hand which is in fearless pose. As she blesses her devotees with prosperity, she is also called as Shubhamkari. Kalratri Devi is worshipped on the seventh day of Navratri. Her above left hand is in fearless pose and she holds Trishul in her lower left hand. Her above right hand has tambourine and lower right hand is in blessing mudra. 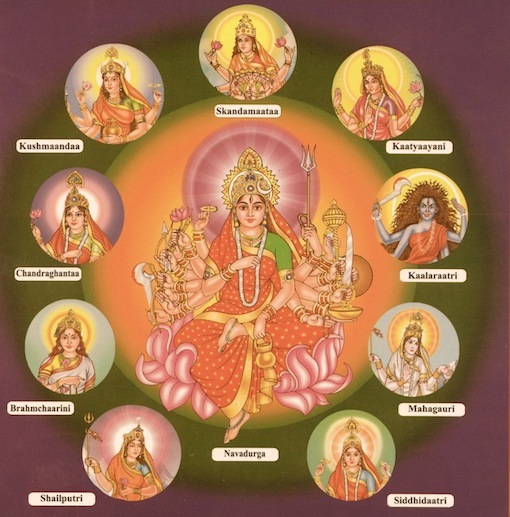 Maha Shakti gives all the eight siddhis Anima, Mahima, Garima, Laghima, Prapti, Prakamya, Iishitva and Vashitva. According to Devi Puran, the supreme God Shiva got all these siddhis by worshipping the supreme Goddess Maha Shakti. With her gratitude, his half body has become of Goddess, hence Lord Shivas name Ardhanarishvar has become famous. Siddhidatri Devi is worshipped by all Gods, Rushis, Muniswaras, Siddha yogis, and all common devotees who want to attain the religious asset. Goddess Siddhidatri is worshipped on the ninth and final day of Navratri. Navratri or Navratra iteslf means nine days. Its the festival of worshipping Goddess Durga Mata in her nine swarups. Singer: Pt. Rajendra Prasad Kimothi, Ph.D.
Sanskrit mantra for global security, followed by explanation in Hindi.